There are different versions of the TechCASH web site for members of the MIT community and MIT visitors. MIT Visitors: If your browser indicates a certificate error, it has been redirected to the secure site. Please ensure that the url begins with ‘http’ and NOT ‘https’. Any member of the MIT community can enroll online for a TechCASH account through the MIT TechCASH web site or by visiting the MIT Card Office. Opening a TechCASH account takes 3 to 5 minutes. When your TechCASH account is enabled, access it through your MIT ID. Note: Copy card vending machines take $5 bills only, and do not give change. Each Guest TechCASH card costs $5. There is a non-refundable fee for each card of $1. Guest TechCASH can be used repeatedly. You can add value with a credit card at any time by visiting the TechCASH web site. Value must be added in amounts of $5 or more through the TechCASH web site. A 2% transaction fee will be added each time you add value to your card. See instructions: Adding value to a Guest TechCASH card. 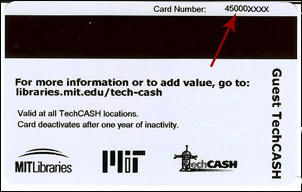 If you need a Guest TechCASH card and cannot pay with cash through the vending machines, blank cards may be obtained by visiting MIT Card Services. Value may be added to any TechCASH account with a credit card through the TechCASH web site. Select "Quick Deposit" from the menu on the left. Unless you are using a Departmental card or are a guest of an account holder and have been issued a TechCASH specific password, use the default tab, "credit card." 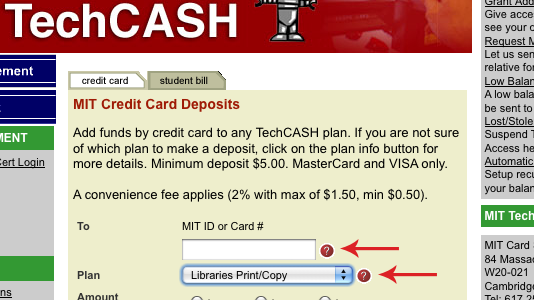 - select the "Libraries Print/Copy" plan if you're part of an MIT department and only want to use your account to pay for copies or prints in the MIT Libraries. Select or enter the amount you would like to add. (There's a $5 minimum). Enter your email address. (This is the address that your electronic receipt will be sent to). Enter your credit card number and credit card expiration date in MM/YY format (example: August of 2008= 08/08). Enter your card security code. Click the "Next" button and your transaction will be complete. If you lose your guest TechCASH card it's like losing cash, unless you register it with the MIT Card Office. Unregistered cards cannot be replaced if lost or stolen. Registering your Guest TechCASH card allows the TechCASH system to know who you are. Cards that are registered with the TechCASH office can have the funds from the lost card transferred to a new card if the card is lost or stolen. The amount of this transfer will be the available balance on the original card (as indicated by the TechCASH accounting system) as of the time the original card was reported lost via the on-line account management system. Note: If you've added value to a Guest TechCASH with a credit card through the TechCASH web site, your card is already registered to you.